Dr. Narahari received his medical degree from NTR University of Health Sciences – Kakatiya Medical College, Warangal, India in 2005. He also earned a master’s degree in community nutrition (MS) from Eastern Kentucky University in Richmond in 2008. 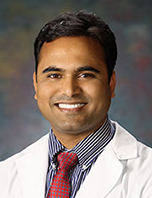 Later, Narahari volunteered as a research assistant at the University of Louisville Department of Psychiatry before beginning his residency in adult psychiatry at the University of South Alabama in 2009. He served as chief resident of psychiatry during his fourth year of residency at the University of South Alabama. Narahari also served on the Graduate Medical Education Committee as a member-in-training representative at the University of South Alabama. His special interests are in the area of biological psychiatry and psychopharmacology. Narahari speaks English, Hindi, and Telugu. He is an assistant professor of psychiatry at the University of South Alabama College of Medicine, Department of Psychiatry. He is board-certified in addiction medicine by the American Board of Preventive Medicine.